Like most people, you probably use Google for all your searches on the Internet. Apart from Google, there is another search engine by Microsoft called Bing. By default, the Cortana search uses Bing to make searches on the web. When you type something in the taskbar search box, the query is sent to Bing and the search results are shown to you. By default, there is no way to set what search engine Cortana should use. Luckily, there is a way to circumvent that. Continue with the post to know who you can do that. You can use a browser plugin which will redirect your searches to Google even if Cortana uses Bing. Right now, this method is only applicable to Chrome because the two extensions which we are using are available only for it. The first step is to make sure that your default browser is set to Chrome. Enable Background apps on Chrome. For that, head over to Settings > System and enable Continue running background apps when Google Chrome is closed. Now, install Bing2Google chrome extension. This extension will redirect all your search queries to Google from Bing. You don’t have to configure anything. Install Chrometana. After it is installed, you will get the option to choose the search engine you want to use. 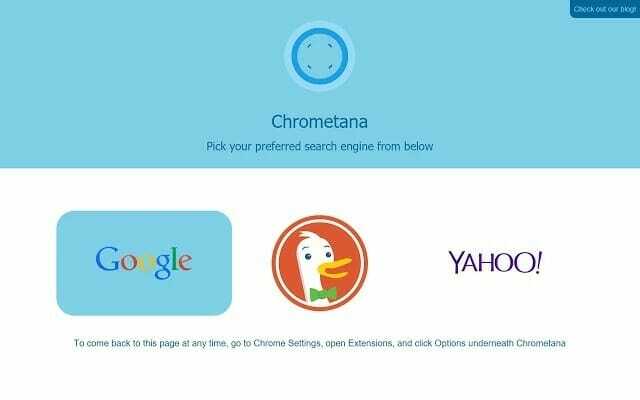 The options are Google, DuckDuckGo and Yahoo search. Click on Google. Once both the extensions are installed and enabled, all your search queries will be sent to Google instead of Bing.